Unfortunately, we missed the March 29 Council meeting that discussed the budget. So we thought it would be wise to review the minutes on the Grimsby Town Hall website to see what was discussed… what did we find, basically nothing. Surprised? Yet, a reporter from Niagara this Week captured quite the conversation. The article can be found in the attached photos. 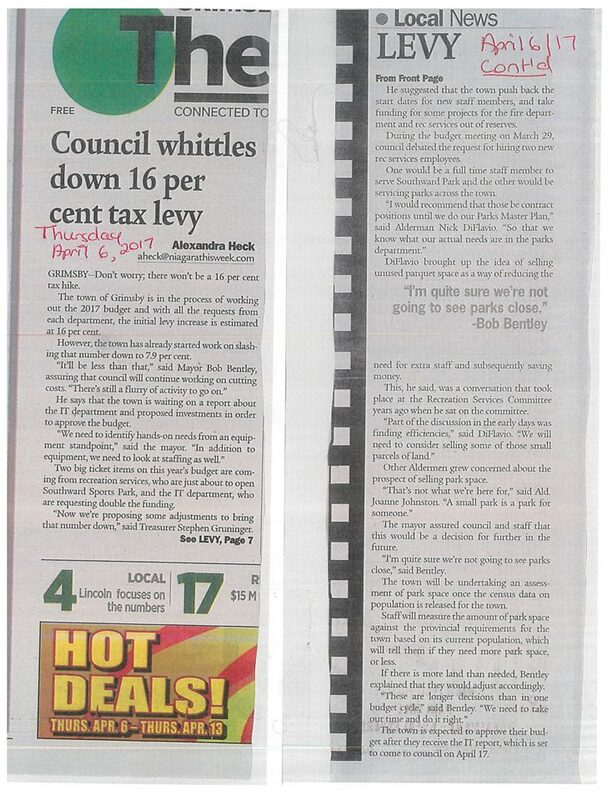 Of course, this statement was then diffused by further discussion that the town would be reviewing the amount of park space required under provincial criteria, then deciding if it needs to be adjusted (meaning, can the Town go ahead and sell the parkettes). If it’s too much work for the Parks Department to mow the grass a few times a year, maybe it’s time to give the parkettes back to the community who will probably gladly mow it if it means keeping it in the neighbourhood. Many of these parkettes were created as parkland dedication by the developer under the Planning Act and belong to the community. See the scan from the 2016 Watson & Associates Development Charges Study for the Town of Grimsby below. So what does this all mean? Keep a close eye on your neighbourhood parkette and ask your Aldermen what they will be doing to protect it. Greenspace, a key component of a healthy, vibrant community, once gone, can never be brought back.